Today I’ll review a project that I completed two weeks ago. The scope of work was to create real estate floor plans of a residence in New York City. It was about two weeks ago that I received a call from a homeowner, who was interested in speaking to me about real estate floor plans. She owned a one bedroom apartment on the Upper East Side, and wanted to sell it without using a real estate agent. She intended on listing the apartment online, complete with a description, photos and floor plans. While I was doing the work, the homeowner was there, and we were talking about various things. It turns out that she grew up in Buffalo, where I went to college, so we had some things in common. While talking, she told me that she called me to inquire about my services, because she liked my website. On the day she called, we briefly discussed the scope of work, I gave her a price which she liked, and so we arranged a date for me to get access to the apartment. Here’s the details on the project. I must note that this apartment had some diagonal walls and a creative use of space, so it took me a bit longer than an apartment with a more standard layout would have taken. I didn’t ignore any of the details, so that’s what added to the time. Type and Location: A one bedroom first floor apartment within a 5 story multi-family walk-up residential building, located on the Upper East Side of Manhattan, NY. Scope of Work: Create detailed real estate floor plans of the apartment’s basement, first floor and rear courtyard. 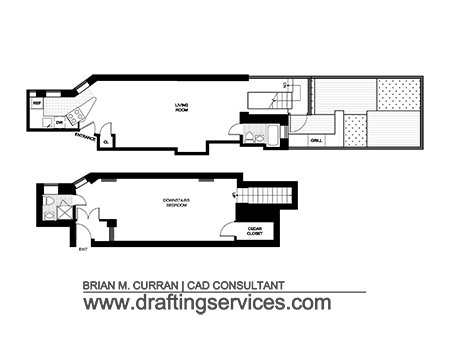 Floor Plan Area: Basement = 362 sq.ft., First Floor = 464 sq.ft., and Rear Courtyard = 251 sq.ft. Was the space occupied with tenants? : Yes. Access Restrictions: No, the owner met me and provided all necessary access. Field Measuring Time: Total of basement, first floor, and rear courtyard. = 2 hours 50 minutes. CAD Drafting Time: Total of basement, first floor, and rear courtyard. = 3 hours 24 minutes. Misc. Time: 0.50hr of project coordination. A project sample of real estate floor plans.